New York, NY (CHELSEA) - Littlejohn Contemporary is pleased to present a one-person exhibition of recent paintings by Lily Prince. The exhibit, Recurring Waves of Arrival, will run from March 7 through April 21, 2018. A reception for the artist will be held on Thursday, March 8, 5:30-7:30pm. The exhibition title, Recurring Waves of Arrival, is taken from a line in a John Ashbery poem. Lily Prince, whose process includes oil pastel drawings and watercolor and gouache paintings, has an extensive exhibition and publication record. She has exhibited widely nationally and internationally and has had her work included in numerous publications and commissions. The paintings in this exhibition, Prince’s first with the gallery, are all inspired by her repeated travels to Italy, where she returns to draw frequently. Her San Giovanni d’Asso series began in 2013 when she was staying for an extended time in a tiny Tuscan village, after completing an artist residency in southern Italy on the Adriatic Sea. Plein air drawing and painting is the basis for all of Prince’s work. 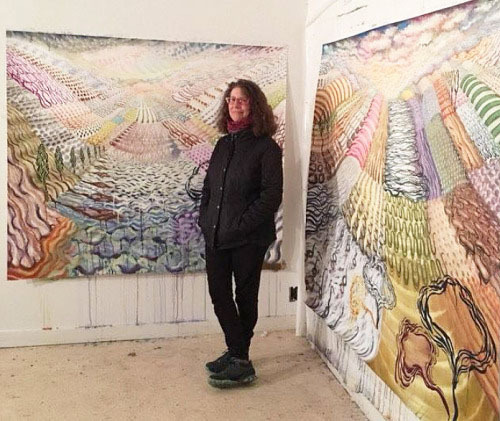 Her love of nature and passion for the beauty of specific terrains inspire her studio work which she does in an 1850’s barn near the Catskill Mountains in New York’s Hudson Valley. This past summer, Prince had another extended stay in Italy-- this time overlooking Lake Como where she began a second series of paintings for her larger studio works inspired by the patterns and rhythms of that particular landscape. Lily Prince considers herself an explorer, studying the atmosphere of diverse spaces. Returning repeatedly to specific views, she combines illusionistic space with the interpretive mark-making inherent in the abstract ordering of the chaos of nature. While Prince’s paintings are rooted in her interpretation of one or two particular places, they combine the memory of past spaces with future aspiration. Prince’s initially observational works portray the pulsating rhythms and fecundity of both NY’s Hudson River Valley and Tuscany’s Crete Senesi. Undulating hills, rippling fertile fields, echoing distant mountains and shifting skies, have a sense of movement that knock the viewer slightly off-balance. Prince’s watercolor and gouache paintings, which range in scale from small to quite large, give the viewer the sense of flying through them, hovering, as the earth shifts in subtle twists and turns. These paintings represent Prince’s visceral connection to nature, to the energy emanating from an evocative terrain, and her constant longing to return to it anew, like recurring waves of arrival. Lily Prince has her B.F.A. from The Rhode Island School of Design and her M.F.A. from Bard College. She attended Skowhegan and participated in The Bronx Museum's Art-in-the-Marketplace Program. Prince also studied abroad on RISD’s European Honors Program in Rome and has lived and travelled extensively throughout Italy. The artist has been awarded commissions by numerous hotels and the New York City Department of Cultural Affairs and her work is in many private collections. Her book of portraits with writer Richard Klin’s profiles, Something to Say: Thoughts on Art and Politics in America, was published by Leapfrog Press, 2011. Prince’s 2nd book includes all of the illustrations for Abstract Expressionism for Beginners, published by For Beginners Books in 2016. Sometimes a particular place can inspire an entire body of work. Claude Monet, for example, was known for painting the same scene again and again from different angles and at different times of day. Prince first fell in love with Italy when she spent a year there as a European Honors Program (EHP) student in the early 1980s and has since returned repeatedly. She has exhibited her work at Vassar College, the Naples [FL] Museum, SUNY Ulster’s Muroff-Kotler Gallery and the Weatherspoon Art Museum in North Carolina, among other venues, and is thrilled to now be represented by Littlejohn.